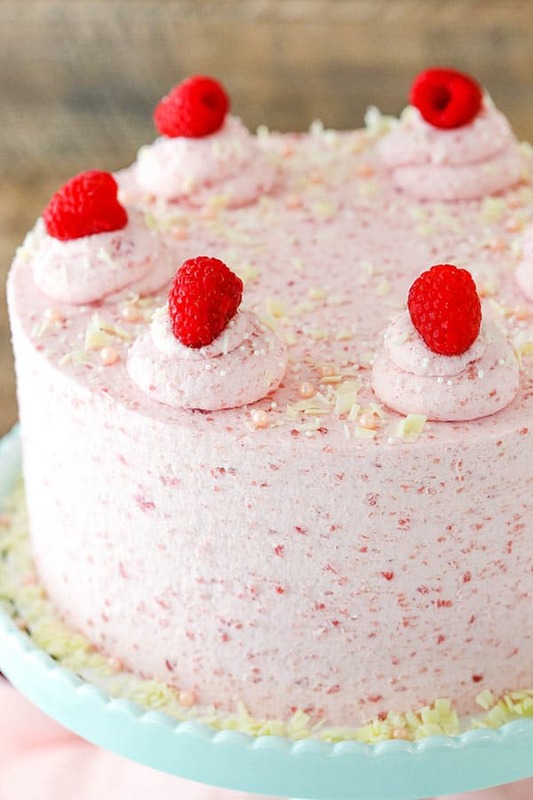 This White Chocolate Raspberry Mousse Cake might just be my new favorite! 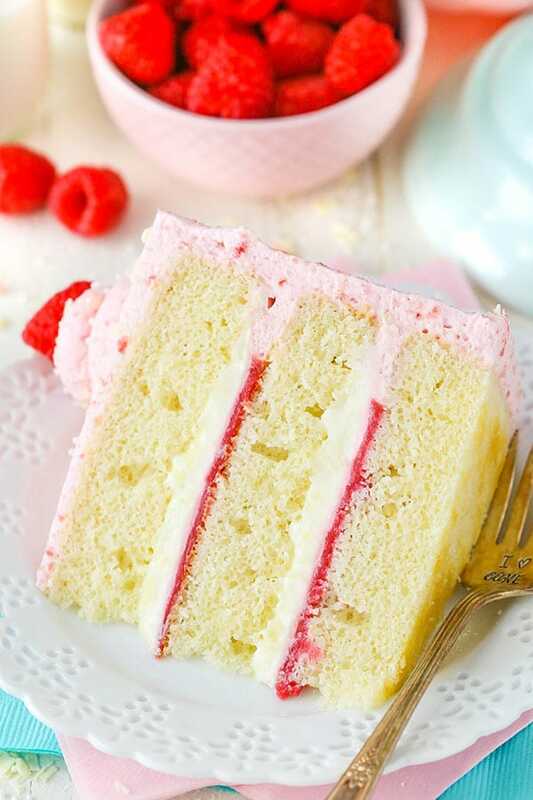 With layers of moist vanilla cake, raspberry filling and white chocolate mousse all covered in raspberry mousse, it’s wonderfully light and pure heaven! You guys, this cake has been on my list to make for so long. Like maybe going on two years or something. It’s a flavor combination that I’ve long loved in just about any form, and I desperately wanted to make it into a tasty layer cake full of light and lovely mousse. The problem was that I just couldn’t decide how I wanted to go about it. 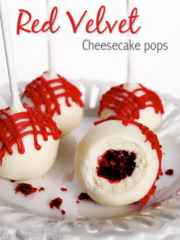 Raspberry is such a strong flavor and white chocolate can be so light once you mix it into something. I kept hesitating about the best way to incorporate them both so that you could clearly taste and enjoy them. Well I finally pushed through when I saw the beautiful raspberries they have at ALDI right now! They are so tasty and reasonably priced – I knew it was time to make this cake. You’ll need about three of the 6-ounce containers, but feel free to stock up on a couple more. If you’re like me, you’ll snack on them while baking. So, to start, you’ve got the vanilla cake. 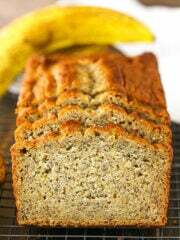 It’s moist, light and one of my favorites. The sour cream adds a lovely taste and moisture that keeps it nice for several days. Just be sure not to skimp on the creaming time for the sugar and butter. It adds air to the batter that gives it that lovely rise, so it’s nice and fluffy! Next is the white chocolate mousse. Oh my goodness, this mousse. I could just eat it with a spoon. You basically make white chocolate ganache and carefully stir in some whipped cream to lighten it up. 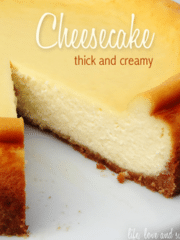 It’s just enough lightness without sacrificing the white chocolate flavor. Love it! And then there’s the raspberries. Puree those babies down for both the filling and mousse that will frost the cake. The filling is made over the stove and it’s super quick. 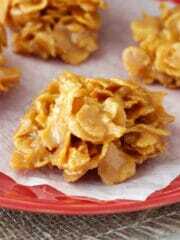 Just combine some of the puree, sugar and cornstarch, and let it come to a boil. It’s not a huge amount of filling, so it heats up pretty quickly. Just boil it for one minute and you’re done. For the frosting, you’ll take the remaining raspberry puree and sprinkle some gelatin over it. After trying a couple methods, I found using gelatin to be the most effective way to ensure that this light, whipped raspberry mousse stays firm and easy to work with as a frosting. And if you haven’t worked with gelatin before, don’t fear! You’ll want to sprinkle the powdered gelatin over the raspberry puree, which should be room temperature or cooler. The cooler temperature of the liquid puree allows the gelatin to bloom. Let that sit for several minutes, then heat it all up to melt down the gelatin and smooth out the raspberry mixture. You then want it to cool back down to at least room temperature before adding to the whipped cream. One thing to note is that the temperature of the gelatin mixture once it cools can make a bit of a difference. You’ll notice on my cake that there’s quite a bit of speckled raspberry in the frosting. That’s because I let my raspberry gelatin mixture cool in the fridge until fairly firm. When incorporated into the frosting, it left little bits of the raspberry mixture throughout. 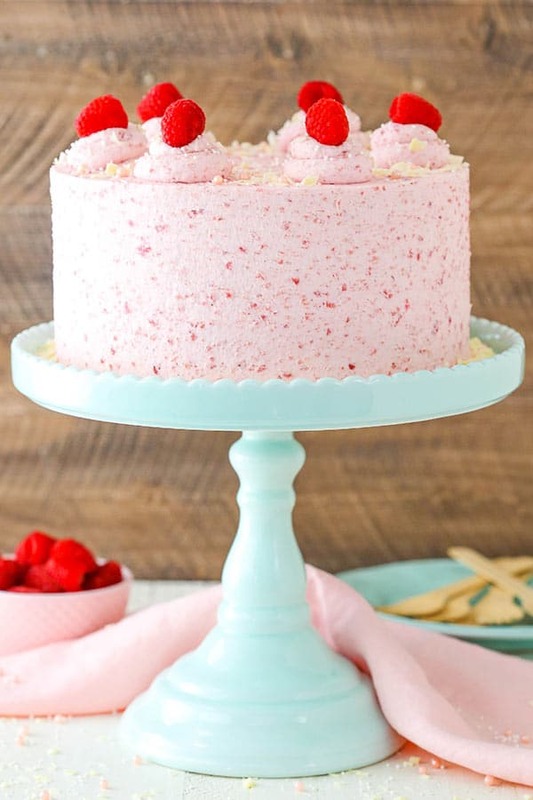 I like the look, but if you want to cut down on the amount of speckling, just try to keep your raspberry gelatin mixture from cooling too much before adding it to the whipped cream. And there you have it! 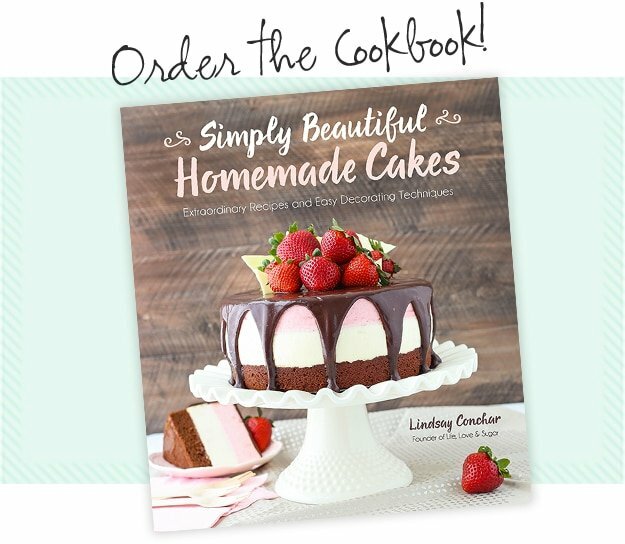 Once everything is made, build your cake and refrigerate it until you’re ready to show it off! 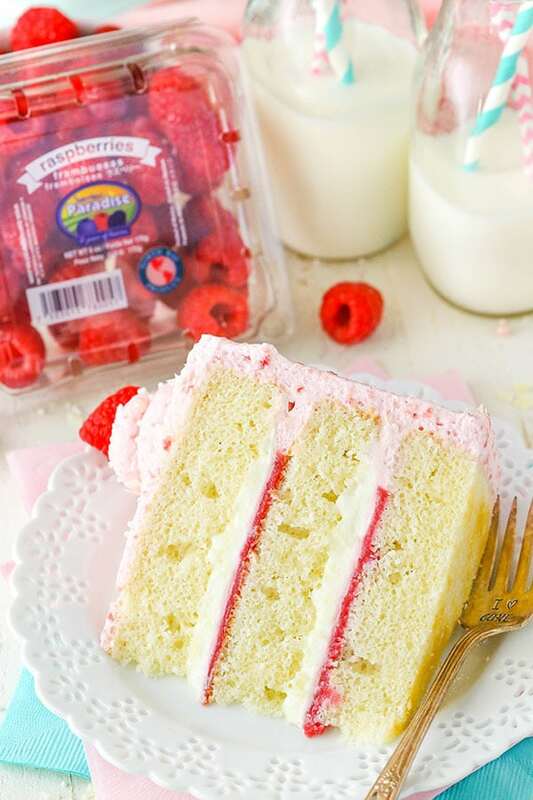 Seriously, this cake is the jam! Why did it take me so long to make it? Thank goodness those raspberries at ALDI finally got me motivated! 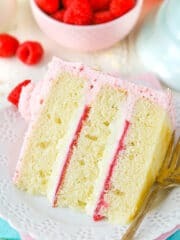 The moist vanilla cake with just enough pop from the raspberry filling and the smooth, light white chocolate mousse is amazing. Then, top if off with a light whipped raspberry mousse, and I can’t even handle it! I want to keep every little crumb to myself. 1. Prepare three 8-inch cake pans with parchment paper circles in the bottom and grease the sides. Preheat oven to 350°F (176°C). 2. In a large mixing bowl, cream the butter and sugar together until light in color and fluffy, about 3-4 minutes. Do not skimp on the creaming time. 9. Heat 1/4 cup (60ml) heavy cream until it just starts to boil, then pour over the white chocolate chips. Cover with clear wrap for 3-4 minutes, then whisk until smooth. Sometimes the white chocolate doesn’t completely melt. If that happens, microwave white chocolate mixture in 10 second increments, stirring well between each increment, until smooth. Set aside to cool to about room temperature. 10. Whip remaining 3/4 cup (180ml) of heavy whipping cream and powdered sugar in a large mixer bowl fitted with the whisk attachment until stiff peaks form. 11. Carefully fold about 1/3 of the whipped cream into the cooled white chocolate mixture until combined. 12. Fold in the remaining whipped cream until well combined. Set the mousse in the refrigerator until ready to use. 13. Puree raspberries with a food processor, then strain through a fine mesh sieve to discard seeds. You should end up with about 1 1/4 cups of puree. 14. To make the raspberry filling, add half a cup of the raspberry puree to a small saucepan, along with the cornstarch and sugar. Heat slowly over medium heat until the mixture begins to thicken and boil. Boil for one minute, then remove from heat to cool. Set aside. 15. To make the raspberry mousse, add remaining 3/4 cup of raspberry puree to a large dish, so that the puree makes a thin layer. 16. Sprinkle the powdered gelatin evenly over the puree and let stand for 4-5 minutes. 17. Heat the puree and gelatin in the microwave in 10-second intervals until warm and smooth. Set the mixture aside to cool to room temperature or in the fridge. Note that the colder the mixture gets, the firmer it will be. 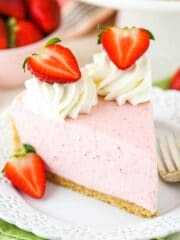 If you want a more cohesive pink color frosting, you won’t want it to firm up too much before adding to the whipped cream in the next steps, but it should be at least room temperature. The firmer the mixture gets, the chunkier your raspberry mixture will be. 18. Whip the heavy whipping cream and powdered sugar in a large mixer bowl fitted with the whisk attachment until stiff peaks form. 19. Add the cooled raspberry gelatin mixture to the whipped cream and gently whip until well combined. Refrigerate until ready to use. If your raspberry mixture was still a little thin when you added it, the whipped cream may be a bit thin. It should firm up in the fridge. 20. Use a large serrated knife to remove the domes from the top of the cakes so that they’re flat. Place the first cake on a serving plate or a cardboard cake round. 21. Pipe a dam of raspberry mousse around the edge of the cake, then spread 4-5 tablespoons of raspberry filling evenly into the center. 22. Add about half of the white chocolate mousse on top of the raspberry filling and spread into an even layer. 23. Add the second cake layer and another layer of raspberry filling and white chocolate mousse. 24. Top the cake with the remaining layer of cake. 25. Frost the outside of the cake. For help with frosting a smooth cake, please see my tutorial. 26. Pipe swirls around the top of the cake. I used Ateco tip 808. Finish off the cake with some additional raspberries and shaved white chocolate. Refrigerate until ready to serve. Cake is best for 2-3 days. hey girl- this makes my mouth water and it’s only 5:40 in the morning! yummy! What a showstopper and it’s made with one of my favorite flavor combos. Thank you for the video and I’m looking forward to making this. Ola, sou brasileira e mora no brasil em minas gerais, amos seus bolos e ja fiz alguns… nessa receita o que usou para derreter o chocolate branco na mousse? parece leite misturado com açúcar tipo glaçucar… mas quanto de leite? grata e parabéns! Wow, Lindsay! 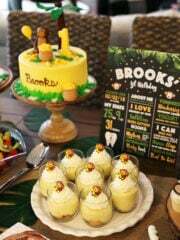 This cake looks super! I am going to make it this weekend for a dinner party. Thanks for sharing. Keep on baking!! I love seeing the lighter side of cake! This paired with the Almond Joy cake would make a perfect choice of desserts for a party. Woow! 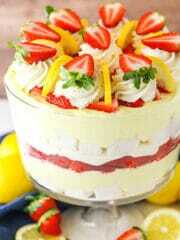 This cakes must taste divine! Love the finish – soo pretty! 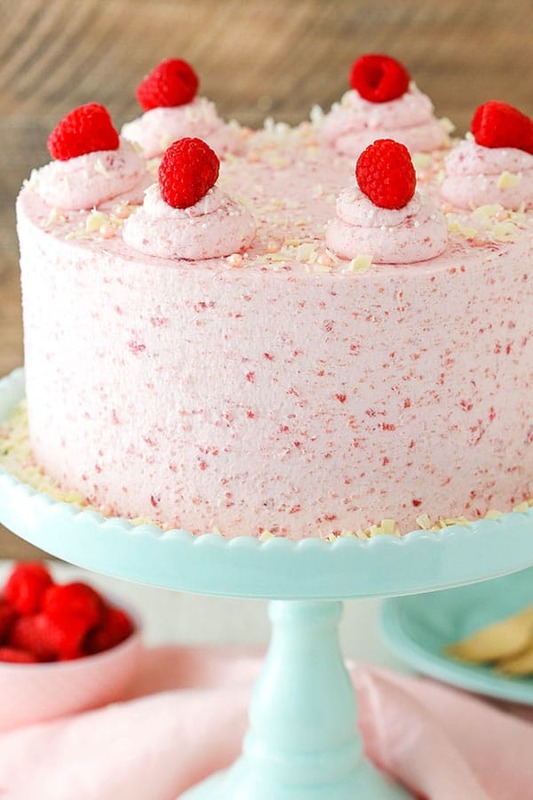 White chocolate and raspberries! What’s not to love! Does this recipe need baking soda? My layers did not rise. No the baking powder is correct. Not baking soda. Are you sure you fully creamed the butter and sugar? Was the baking powder out of date? Hi! I am planning to make this cake for my sister’s birthday this weekend. I will have to travel 2 1/2 hours with it. Do you think it would travel well assembled? Also, if I make all of the ingredients the day before, refrigerate, and assemble the next day, would that be okay? Thanks for any advice. I have made a few of your cakes recently and they all turn out so yummy! Hi Melissa! Glad to hear you’ve enjoyed the recipes! With all the mousse, I’m not sure how it’d travel for that long when not refrigerated. It might be ok. As far as assembly, I think it should be ok to make things ahead. The cake layers, definitely. Your recipe calls for baking powder but in the video it says baking soda. Which one do you use? I sure hope it’s the powder as I have just made this!! I wouldn’t suggest baking the batter all at once. Your best option would be to try baking one layer at a time. LOVE this idea for a wedding cake for a very small informal wedding party but I am confused on how I would make the frosting without any raspberry specks; I want the outside of the cake to be white. Can I add the gelatin without the raspberries, maybe some water instead of the raspberry puree? The frosting a stabilized whipped cream, correct? 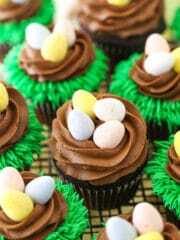 I love the your new white cake recipe for Moist Vanilla Cupcakes as no egg yolks are wasted. 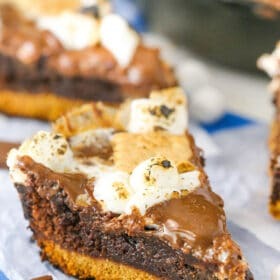 Do you think that recipe is dense enough to accept the fillings or should I go with the recipe for the cake part in this recipe? You could just leave the gelatin and raspberries out – just use the heavy cream and powdered sugar. The powdered sugar stabilizes the whipped cream. I think either cake would do well with the fillings. I’ve used them both. Why, why, why, just egg whites? Lightness? Have you tried it with ehole eggs? I believe in the goodness of the whole egg and would not make it without using them. Hi lindsay, may i know how you bake 3 pans at the same time, my oven has only 2 racks, and should i turn the oven up and down with fan or only down with fan? There may some differences in out ovens. I’m not sure that I have control over the fans separately to say. I usually try to position my two racks so they are both roughly in the middle, with two cakes on the top and one below. I made the cake for the wedding, while the combo was delicious, I found the cake part to be very dense, I would have preferred it to be lighter in texture. I did not add any raspberries to the frosting (stabilized whipped cream) because I wanted it to be all white. I did use seedless raspberry jam instead because Aldi’s did not have any. The substitution was perfectly fine. It shouldn’t be especially dense. Be sure next time to really cream that butter and sugar well. It’s what gives it a nice rise. Hey Lindsay! 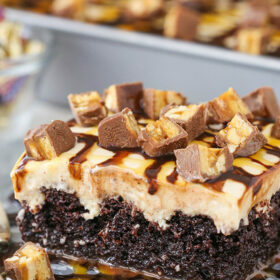 Your recipes are so good … and I’m going to try this one for my cousins birthday .. I have a question.. can I use this frosting to decorate? Is this gonna hold it? It’s a relatively firm frosting with the gelatin. It would work for simpler decorations, but might not be ideal for anything more complicated. 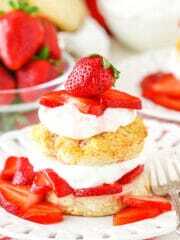 Can I add shortening or butter in whip cream? I would recommend butter over shortening. instruct to whip the egg whites until stiff?!? I did anyway as i was worried it wouldn’t work otherwise. Secondly the white choc filling makes Twice as much as needed as my layers were overloaded and collapsing until i removed at least half of the mousse filling. I got it under control after that! Flavours amazing…i’d upload a photo if i could ???? Nope, I didn’t forget any instructions. The egg whites are not whipped before adding. If you did whip them and it worked, then great! For the filling, what tip did you use to create the frosting dam? I use a large round tip (Ateco 808) that allows me to fill it in with plenty of filling and not have issues with it moving around. Also, if the frosting used for the dam is too thin, it won’t keep everything in place. Lindsay, I made this cake for Father’s Day and everyone absolutely loved it said it was one of the best cakes they have ever had. Mine didn’t come out as pretty but I know what I did wrong and can’t wait to make it again! I know it is a favorite with my family now and they will be asking me for it. Thanks for sharing such wonderful recipes! 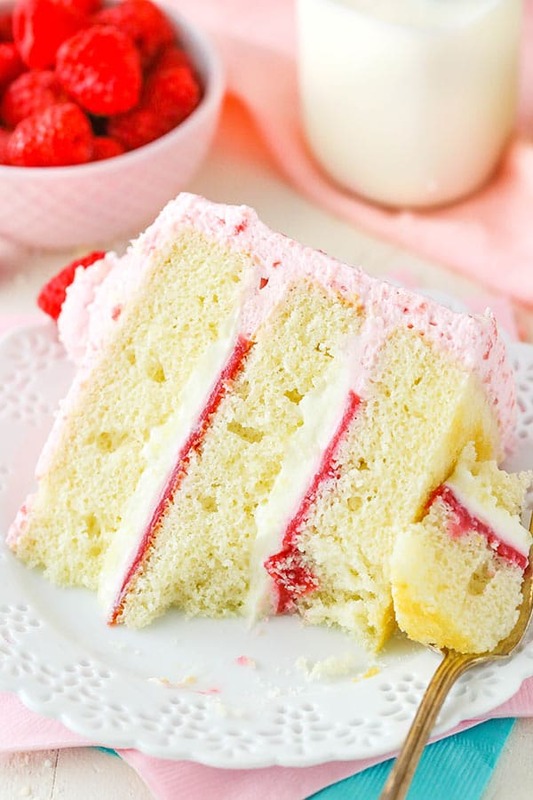 For this white chocolate raspberry cake instead of vegetable oil can we add butter? if yes how much quantity of butter. I’m not sure where you are seeing vegetable oil listed. This cake is already butter based. can I use a 8 inch pan for this? Yes, I recommend using 8 inch pans. Can I frost the cake with the white chocolate mousse? Hmm, possibly. It’s definitely a softer consistency, so I think it’d be fine but I’m not entirely sure. Hi. Would I be able to make the cakes and freeze them for a few days before decorating it? You could, sure. I recommend wrapping them very well and thawing them in the fridge. Hello. I have made many of your recipes and they are all fabulous. Just one question – can frozen raspberries be used in this recipe? That should be fine. I’d just thaw and pat them dry before using. Hello, your recipes look amazing, I can’t wait to try them out!! :) I was just wondering what size of pans to use and what depth?? Thank you! It depends on the recipe. For this recipe I used 8-inch cake pans. Hey there! 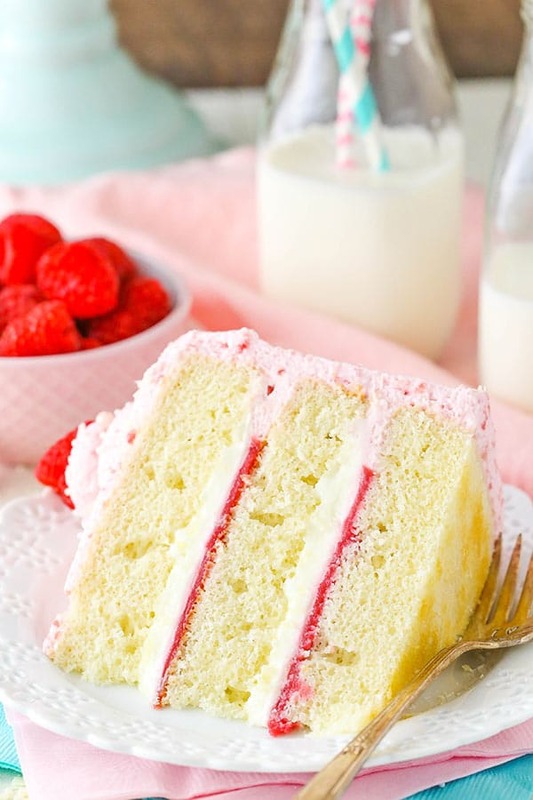 Could I make this cake Ruth strawberries instead of raspberries? I have a friend that’s a strawberry fiend! Yes, strawberries should be fine as a replacement for raspberries. Hi, I’m not sure why all of my comments are not getting posted, here’s another try! If I omit the salt for the cake batter, can I use salted butter? I only have full fat yogurt, do you think I can use that in place of the sour cream? Yes, salted butter is fine. You could use yogurt, but I do think it changes flavor and texture a bit. I personally think sour cream is best. Hi there! Is the link for the recipe removed? Thank you.